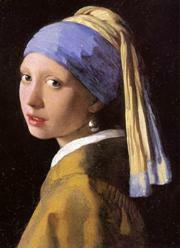 In 17th century Delft, the painter Johannes Vermeer (Colin Firth) paints the famous portrait of the title. This film, based on a novel, is the story of the serving girl who may have been the model for the painting. Scarlett Johansson gives a good performance as the serving girl, but Colin Firth is not really convincing as the painter. The pace of the film is slow and the plot and characterisation is limited , but the direction, photography and sets/costumes are effective.